Essential oils can be found in most homes. People have realized that not only do they smell amazing but they have fantastic extra health and well being properties. Making your own DIY Essential Oil Cleaning recipes is easy, they are effective plus all the positive benefits of essential oils. Essential oils when used in the home and in properly blended body products can help to uplift moods, calm the nervous system, give focus, help with sleep and boost immune systems. You can easily make your own cleaning recipes. Recently the cleaning properties of Essential oils have also become more mainstream. Many households are wishing to move away from unnecessary chemicals and synthetic fragrances. Making your own cleaning products has never been easier and Essential oils play a big part in helping your cleaning recipes to work better and to bring those amazing health benefits into the mix as well. We have put together an ebook with 12 Cleaning recipes that suit will suit every home. When using Essential oils – It is important to store your oils and products containing Essential oils in dark colored glass, like the Amber glass bottles we have pictured ( and clearly labeled !). Essential Oils will oxidize when exposed to light. Essential Oils will also degrade plastic, so it is important to store them in glass. 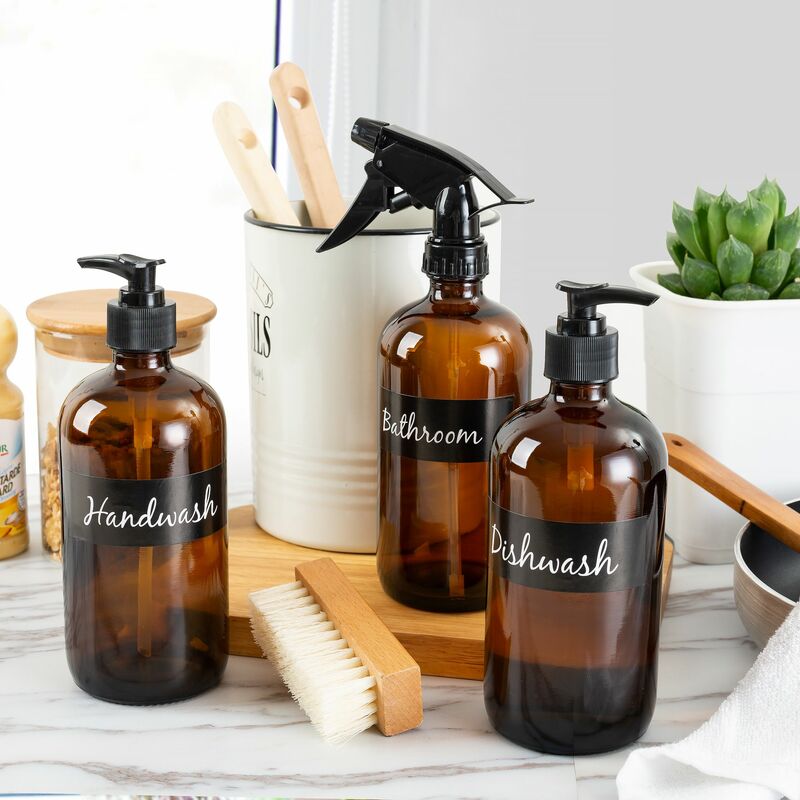 These 16oz glass bottles will help you to create and store your own Essential Oil Cleaning products and you get the fancy set of labels so you can make and label your bottles so easily. As a bit of extra love – We have also given a 15% off discount code automatically applied at the checkout for a limited amount of coupons. Grab your set now to get the code applied. Click on the button below. Note that the recipes in our Ebook strongly recommends the use of alcohol as a preservative. If you love the labels that we have designed for the bottles – We have also created a set of labels with the same font for your pantry. You can check them out here – And yes….I have another sweet discount code you can use!! You can click on the images or on the button to get these awesome labels and a 10% discount. I love essential oils but I´ve only used them for health issues. I´ve never thought for using them for cleaning but I will give it a try! I can’t wait to try these recipes. I’m starting with the dusting spray! Thank you for the variety of options. Oh that’s awesome! It smells so good! Much nicer than store bought sprays. I have recently just started using essential oils more, and have been amazed by their benefits in general – but I hadn’t thought to use in cleaning products. I will definitely give this a try soon! You have shared fantastic organic idea to clean with Essential oils. It’s worth trying this stuff. I had no idea there so many different uses for cleaning and essential oils! Thanks for sharing!!! This is so helpful! I’m always looking for natural cleaning recipes and utilizing essential oils is such an amazing way to create your own natural cleaners. Thanks for the recipes. I love essential oils but I’ve only really known to use them for health and to relieve stress and what not. I had no idea you could use them as cleaning products! That’s such a neat idea. Thank you so much for sharing!